Abled to Do Anything | Arts and Culture | Style Weekly - Richmond, VA local news, arts, and events. SPARC staffer Melody Winters, at left, leads students through a rousing musical number slated for "Live Art" at CenterStage on June 3. The kids include Liberty Arbitelle, Natalie Schwartz, Juliet Fugman, J'kwan Pryor, Sam Hanczaryk, Jamel Lanier, Shanti Bhagat, Bryson Olivo and Chris Russo. When Robyn O'Neill's 13-year-old daughter, Karsen, arrived home from her first "Live Art" class in January, she proclaimed excitedly: "I'm different! I'm different!" This wasn't news to O'Neill: Karsen has Asperger's syndrome, a psychological disorder on the autism scale that affects a person's ability to interact socially. "At school, she knows she is different and she hates it," O'Neill says. But in the course of the class, O'Neill realized, different had become special. Karsen is just one of three-dozen differently abled children taking part in SPARC's "Live Art" project, a groundbreaking multidisciplinary arts-education program culminating in a star-studded performance at Richmond CenterStage on June 3. 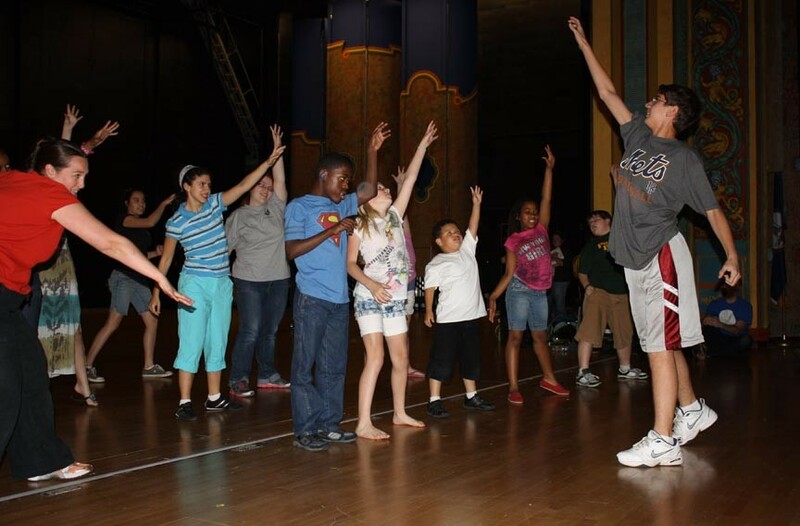 The 20-week project was built around a simple cornerstone: Even when kids such as Karsen have access to classes in the performing arts tailored to their specific needs, they rarely have the opportunity to perform in mainstream productions in front of live audiences. So SPARC — short for the School for the Performing Arts in the Richmond Community — brought together artists, directors, teachers and performers to create a blockbuster event in which the talents of the kids couldn't help but shine. Included on the published slate are luminaries such as Susan Greenbaum, Steve Bassett and Robbin Thompson. Samson Trinh and his Upper East Side Big Band will back up all of the performers. Alumnus and long-time supporter Jason Mraz is listed as an "artistic advisor" on the project and sources are mum — somewhat pointedly mum — on whether he'll appear. The evening will feature polished musical performances augmented by spontaneous acts of creativity, carefully shepherded by a legion of supporting professionals from schools including the Faison School for Autism and Northstar Academy. There will be dancing — but in one segment the dancers will have paint on their feet, resulting in an instant mural. There will be singing, including an American Sign Language choir. And there will be comedy, as an itinerant band of mimes provides a line of pratfalls and hijinks. Richmond Ballet veteran Danae Carter, a teaching artist for the project, says the spontaneity built into the evening's structure redefines expectations about what performance can be. "I'm less nervous about this than any other project I've been involved in," she says. "Whatever happens, it will be great." This audacious experiment might not have happened if Erin Thomas-Foley hadn't struggled with insomnia when she was pregnant. In the wee hours of one night during the summer of 2010, the school's director of education found herself thinking about a specific special-needs student in one of her classes. The girl loved to perform and had auditioned for a number of shows but had never been cast. Thomas-Foley started to imagine an event that was "big, life-affirming and safe," she says, inclusive of all kinds of performers, regardless of their abilities. The idea percolated for months. "I was afraid to talk to anyone about it," she says, "and when I finally mentioned it, I was prepared to have people say, 'You're crazy, you can't do this.'" Instead, Executive Director Ryan Ripperton was immediately supportive, even though the project wouldn't directly benefit the organization. Meetings with potential funders followed and, thanks largely to the Stanley and Kim Markel Memorial Foundation, the school was able to offer the 20 weeks of classes for free. Thomas-Foley built a network of partners including the Richmond Boys Choir, Richmond Ballet's Minds in Motion and Dreamers Theater, a troupe of adult performers with disabilities. But Thomas-Foley still needed kids — the right kids — for the program. She individually interviewed every applicant and their family. Most of the applicants didn't have any performance experience and, while all of the children involved are high-functioning, there were no guarantees about how they'd respond to the rigors of the program. "Live Art" takes place Sunday, June 3, at 5 p.m. at Richmond CenterStage. Tickets are $35 with VIP packages for as much as $250. Call 353-3393 or go to sparconline.org for details.